For years Viktor Medvedchuk was one of a select few Ukrainians allowed to fly direct from Kiev to Moscow, where he led back-channel negotiations with Russian leader Vladimir Putin over the proxy war in Ukraine’s south-east. But after another visit last month to promote closer ties with Russia during Ukraine’s election campaign, Mr Medvedchuk found himself accused of treason by President Petro Poroshenko. Not only was Mr Medvedchuk made the target of a secret service investigation, Mr Poroshenko’s cabinet also changed a regulation to ban him from any further attempts to cross the border. Mr Medvedchuk, a prominent advocate in Ukraine for rapprochement with Moscow and the leader of a pro-Russia party, admits his cause is a hard sell. “In the last five years Poroshenko has made Russophobia and anti-Russian hysteria state policy,” he said in an interview this week at his Kiev headquarters. Mr Medvedchuk’s ties to the Kremlin — the US once described him as a “longtime proxy and close personal friend” of Mr Putin — give him a rare vantage point ahead of a Ukrainian presidential election over which Russia looms heavily. “Putin wants Ukraine to be a normal country,” he said. Public opinion in Ukraine has swung firmly against Moscow since it annexed Crimea in 2014. The war Russia began soon after has claimed more than 10,000 lives and spread to a new theatre late last year when Moscow arrested 24 Ukrainian sailors following naval clashes in the Sea of Azov. In the run-up to the election — and with his negative ratings well over 50 per cent — Mr Poroshenko has ramped up hardline anti-Russian policies, accused his opponent, comedian Volodymyr Zelensky, of being a “Russian puppet” and put up billboards depicting a “decisive choice” between himself and Mr Putin. Mr Zelensky’s surprise surge — polls predict he will coast to victory in Sunday’s second round — has been greeted with glee on Russian state television in recent weeks thanks to his animosity to Mr Poroshenko and more conciliatory policies towards Russian speakers. The Kremlin, no fan of Mr Poroshenko, was initially resigned to his re-election: one senior Kremlin official described him as “someone we know, and know we cannot work with”. But it is cautious about prospects for reconciliation under Mr Zelensky. A former presidential chief of staff, Mr Medvedchuk was a surprise choice as liaison to the Kremlin shortly after war broke out in 2014. He had campaigned heavily against a trade deal with the EU and the pro-western revolution that brought Mr Poroshenko to power. The US imposed sanctions on him for “violating Ukrainian sovereignty” once Russia annexed Crimea. Despite the fallout from his Moscow trips, Mr Medvedchuk says he met Mr Poroshenko as recently as last week. 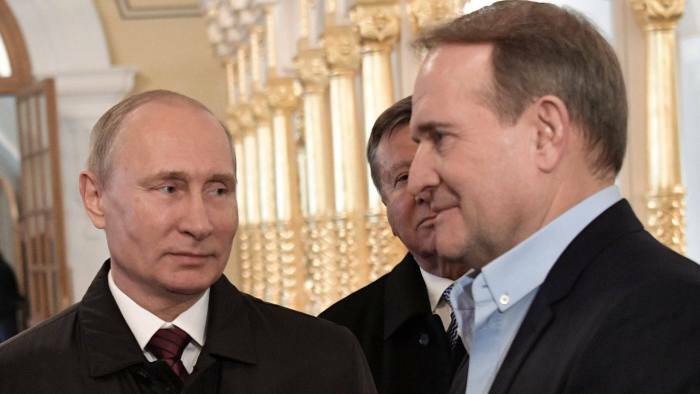 News channels owned by a close friend have covered the president’s entourage favourably, fuelling criticism that Mr Medvedchuk’s continued prominence points to a modus vivendi for Russian interests in Ukraine. “He always came to me with requests, I always fulfilled them,” Mr Medvedchuk said. “We are still talking about what we can get done now.” Mr Medvedchuk said he was able to secure the release of 485 prisoners before he fell out with Mr Poroshenko last year over what he claims was the president’s violation of Ukrainian commitments. The exchange deal collapsed. He laments that the business ties that once bound Ukraine’s oligarchs to Moscow’s have frayed since the country deepened its relationship with the EU. “It’s still in the interests of our country for Russia to invest and grow business in Ukraine,” he said. “Now that’s gone . . . We lost $20bn in export potential,” he said. Read the original text at Financial Times.